Social Media and Ecommerce are like twin brothers. One without the other will feel lonely and both of them together will result in awesome teamwork. Once a buyer decides to purchase any commodity online, he is bound to be affected/ influenced/ inspired by the social media. After all, it is the online space where the transaction happens and the Social Media rules the online world. Hence, if we try to decipher which ecommerce brand commands maximum attention and attracts maximum popularity, then it is quite obvious that we will dig out the social media outreach and then determine their stand. Indian retail industry estimated at USD 500 Billion is ranked among the top 5 in the world, but Indian eCommerce has a share of only 1.5% (as of 2012). It is projected that by 2015, Indian eCommerce market will swell to $34 billion and this means that more and more social media engagement is the call of the hour. about 1.5 million mentions from September to December 2012 to arrive at the following findings. 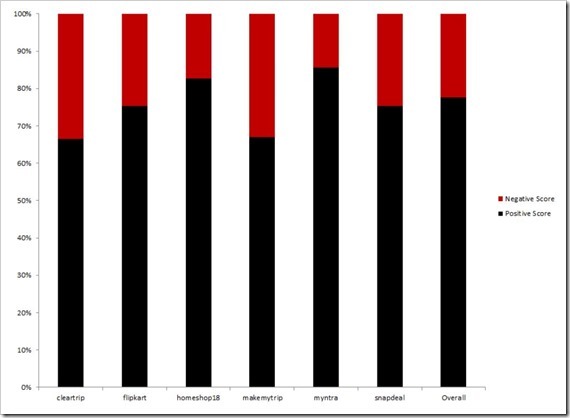 Let us go straight to the data, and find out the social media outreach of Indian eCommerce brands in 2012: The best and the worst. How did the brand interact with their customers? Were their queries properly researched and solutions offered? How was their customer service on the social media platforms? Around 7,889 conversations on social media were tracked and analyzed for this report. Flipkart was rated the best brand for customer satisfaction, While IndiaPlaza was at the other end of spectrum. 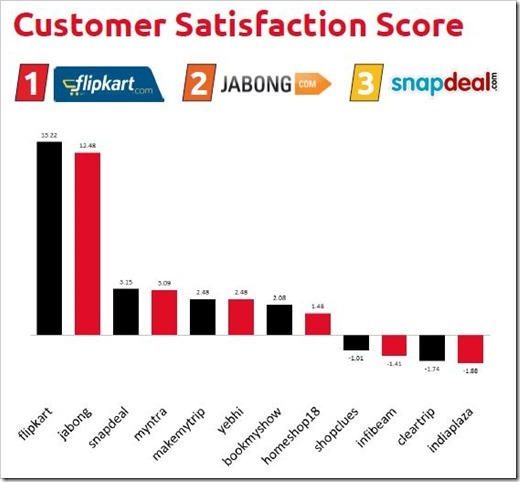 Interestingly, Cleartrip had the second lowest score in customer satisfaction! 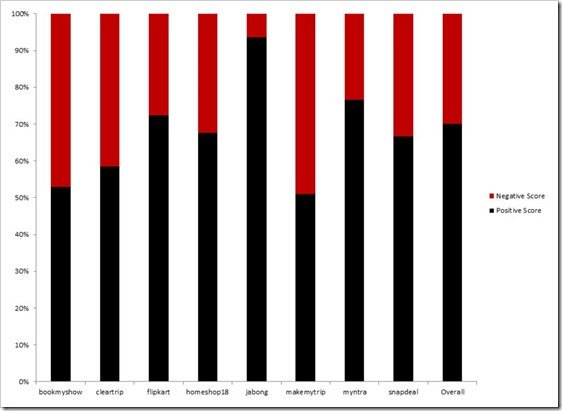 What is the overall brand sentiment of the ecommerce brand? How do the customers response to their social media posts and information? Brand Sentiments showcase the overall image and outlook of the brand inside social media. 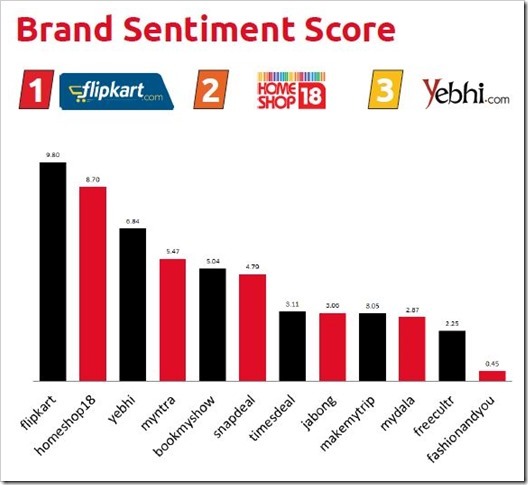 Based on 84,422, Flipkart had the best sentiment score while Fashionandyou was rated the worst. How soon the brands respond, once a user sends out their query on social media? How much time do these brands take to reply back? Response time was calculated based on 800 customer interaction with the brands using Tweets. MakeMyTrip was rated the best at 0.16 seconds, followed by Myntra who had a response time of 31 seconds and IndiaPlaza is the worst at 12.15 minutes. While the median response time was of 0.51 seconds. Social Media users actively query regarding the brands through-out the day, however, time between 11:00am to 7pm generated 3 times the queries (300 per hour) as compared to queries between 9 am to 1am. Interestingly queries that come between 1pm to 2pm garner highest response rate from Brands, so if you want to get your query answered from a brand, that is the time your tweet or put up a Facebook message! Which brand managed to increase their followers count? How their social media was outreach efforts materialized and how did the users responded? This report was generated after tracking the social media efforts of these brands for a period of 27 weeks. 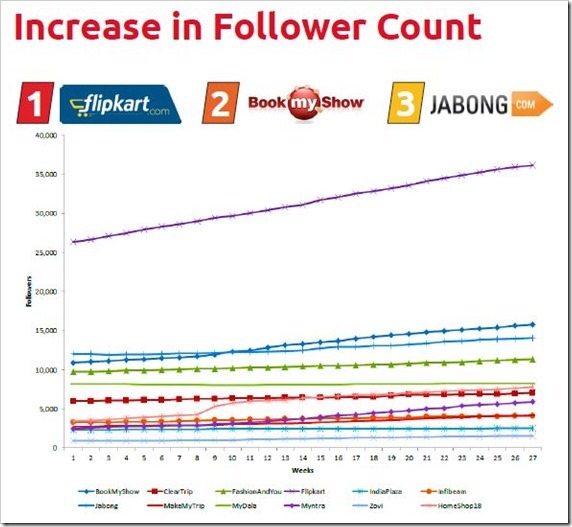 Flipkart again trumped all other brands when it came to follower count growth. It was the biggest and fastest growing community. Bookmyshow also performed well during these 27 weeks and made big gains on follower counts. Delivery is the most important aspect for an ecommerce brand. Once a product is delivered at the customer’s location, he may share his emotions and feelings. Flipkart and Jabong came up trumps on delivery criterion with 65 percent positive sentiment. Infibeam performed worst of the lot with less than 20 percent users showing positive sentiment. How do the customers respond to the customer service aspect of ecommerce brands? This graph shows the customer service sentiments as expressed by the customers on social media. Jabong seems to have figured out the Customer service puzzle in India, as they had over 92 percent positive users talking positively about their customer service. MMT had lowest score among top sites with nearly 50 percent talking negatively about them on Social Media. How does an average customer perceive the ecommerce brand, depending on all the above sentiments, especially delivery and customer service, along with response time? Surprisingly, It is not Flipkart that has the maximum positive perception. It is Myntra that emerges as the clear winner followed by Homeshop18 and then Flipkart . This research and study may or may not be perfect and accurate. But based on the overall picture, we can surely have an idea as to which eCommerce brand is the favourite among Indians and how much social media influence they have. Jabong has a high customer satisfaction score but a very low brand sentiment score. Seems like disparity. Any possible reason?